Now that spring is in full swing and summer is right around the corner, take advantage of your reborn, transformed yard! Showing off your attractive landscaping is well worth the effort. 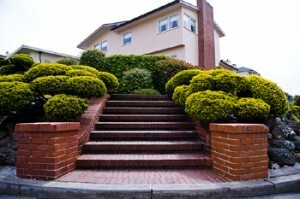 What you might not realize, however, is that landscaping could turn a homebuyer off as fast as it can turn one on. Depending on your yard’s appearance, it could make or break a sale for you! Follow these rules and you should steer clear from landscaping mishaps. Always keep your lawn mowed, trimmed and attractive. But in the process, don’t overcut it. Set your mower’s blade at three inches for less stress on the grass and less need for water. Though this might mean mowing more in the short-term, it’ll display a healthy lawn in the long-term. Water the lawn early in the morning or late at night. This helps the grass retain the most water, and it won’t turn brown from being singed. dandelions are weeds. Get rid of them. Spray the lawn, pull the weeds, and try not to kill the grass in the process. A weed-free lawn appears maintenance-free and appealing. appeal that is noticed at first glance. Keep them looking trimmed and professional by snipping away flyaway branches that interfere with windows, walkways and each other. foliage that resides too close to the exterior can take away from that appeal. If a window provides a premium view, cut the foliage back so the view is totally visible. If the siding shows off an attractive stone or brick façade, don’t feel the need to hide it! trimmed of weeds and unwanted underbrush. If the garden isn’t flowering, stick some annuals in it for a short-term appeal (but don’t lie to the potential buyer and say they are part of the garden). If it’s a vegetable garden, make sure none of the veggies are rotting! Wash down everything that will be visible to a home buyer, from the vinyl siding and the aluminum shed, to the brick patio and the concrete driveway. If gardening wasn’t part of your weekend ritual, just purchase some pots of annuals for your walkway. Homebuyers might appreciate the homey appearance, and at the same time, take comfort in knowing that they don’t have to deal with landscaping. could help a homebuyer imagine living comfortably in this peaceful retreat: Add a hammock, a birdhouse, a picnic table or a bench underneath a shading tree. Follow these landscaping tips and your yard should steer toward making a positive sale!